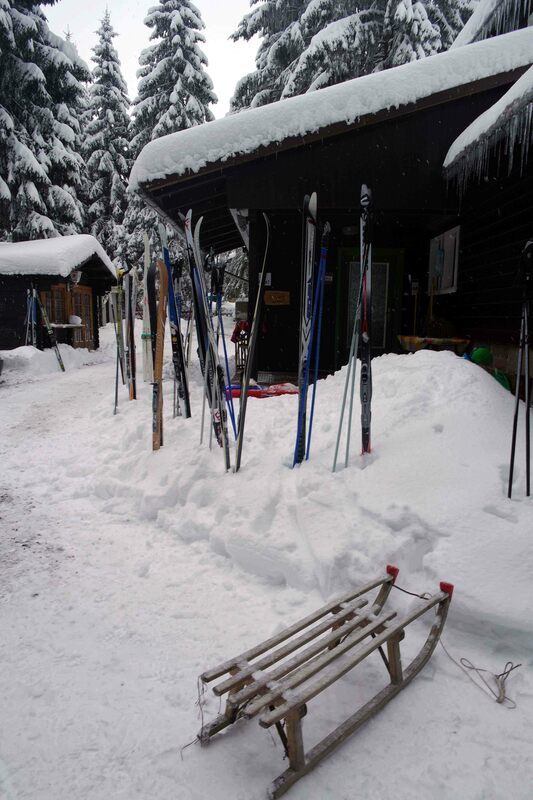 When my Czechman moved to Berlin over three years ago, he brought his cross country skis with, ever hopeful that there would be enough snow one day for him to ski to work. So far it hasn’t happened! 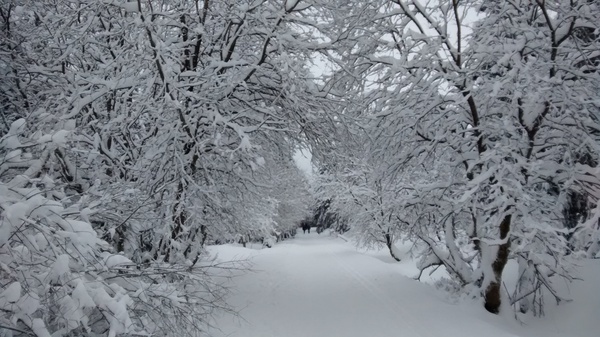 Rumour has it when it snows enough you can cross country ski in Tempelhof, the old airport that is now an open park in Berlin, but that hasn’t happened yet either. 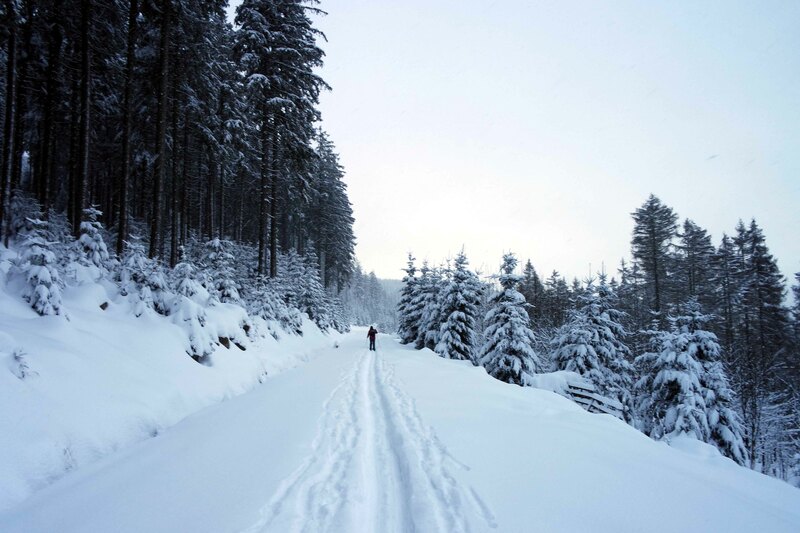 But for cross country ski lovers, never fear, the beautiful Harz mountains lie only three to four hours away from Berlin. 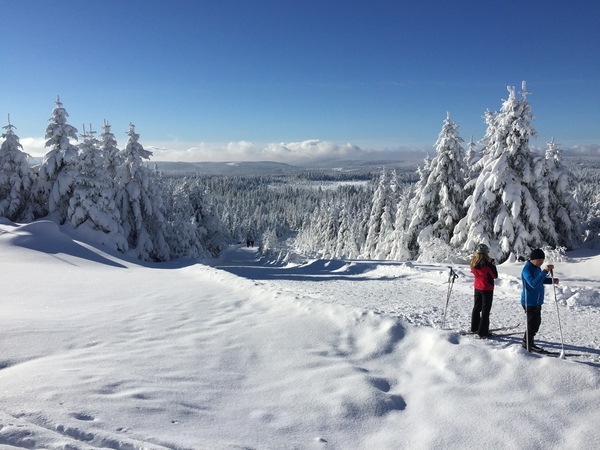 This is the highest mountain range in north Germany, with the highest mountain, the Brocken, standing at 1141m. 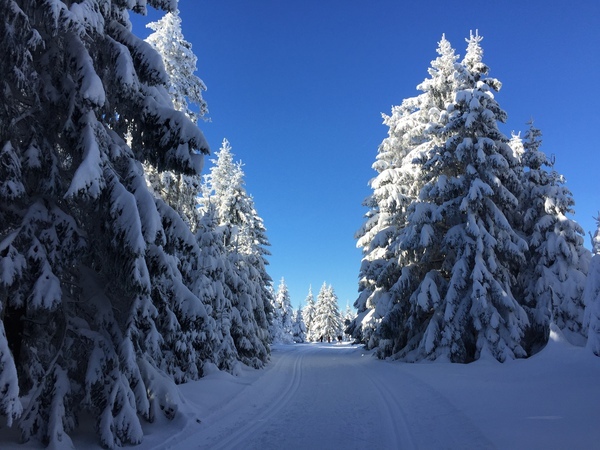 When it snows, it is transformed into a winter wonderland, as magical as the mountains of Switzerland, with spruce trees coated deeply in powdery snow. 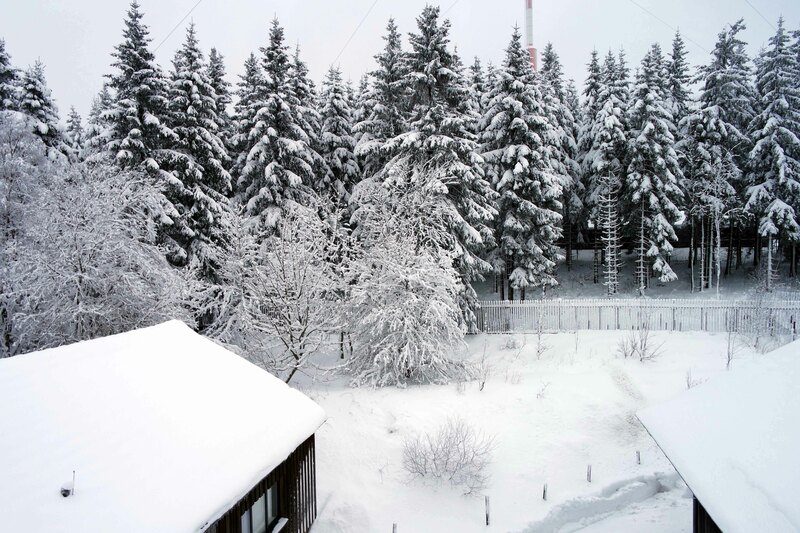 I did not think it was possible to find this much snow so close to Berlin. 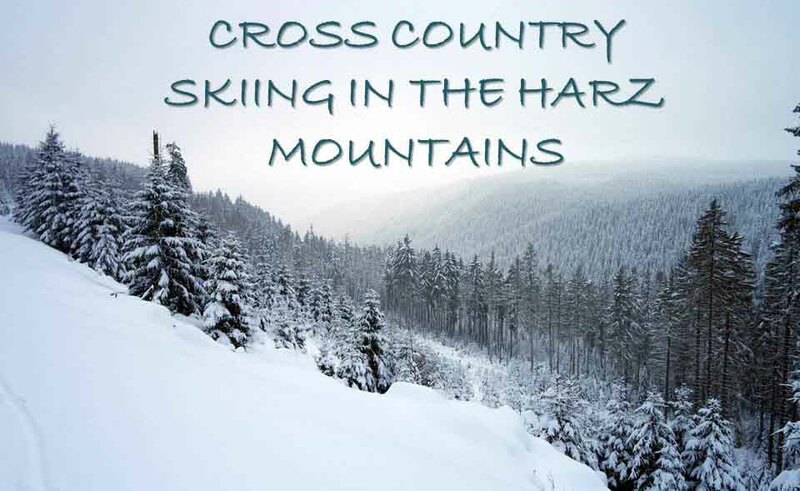 The Harz has been a stage for many historical events. As early as 968, silver deposits were discovered. In the middle of the 14th century, much of the population was decimated by Black Death (the plague). During World War 2, many arms factories were established in Harz, with forced labour camps. 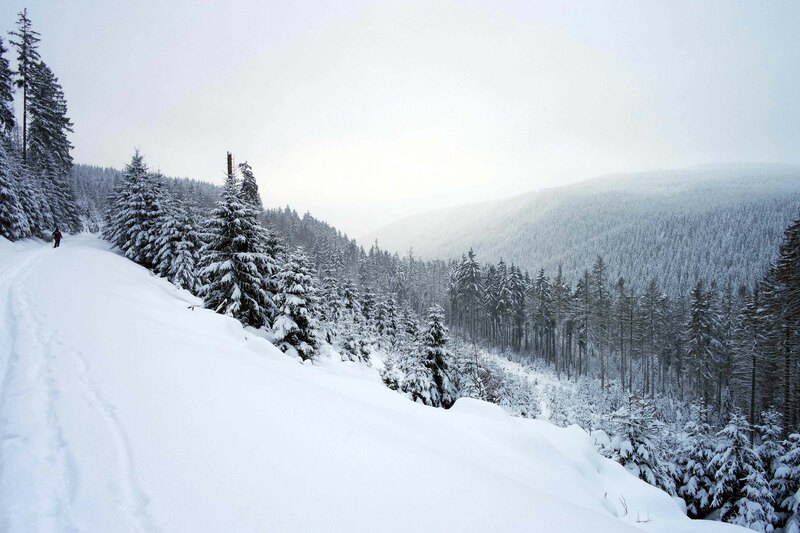 The famous German poet, Goethe, visited the Harz many times. 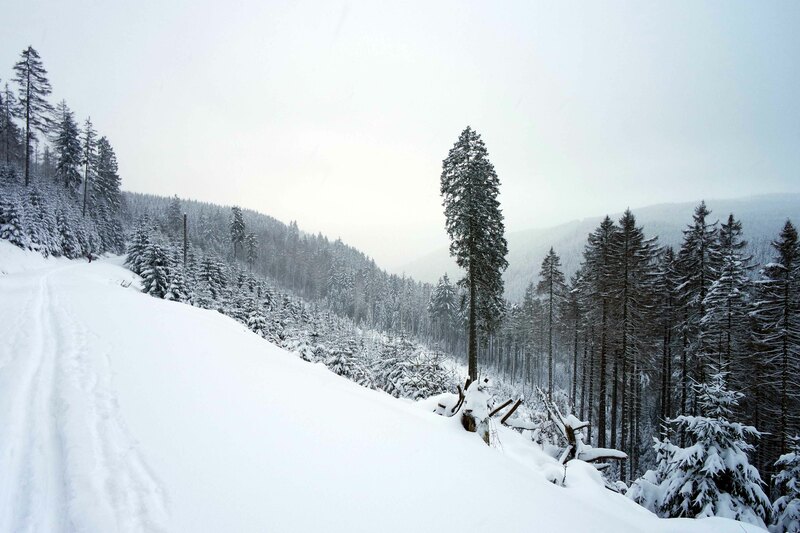 In 1777 he climbed the Brocken, departing from Torfhaus (where we stayed on our weekend there!). 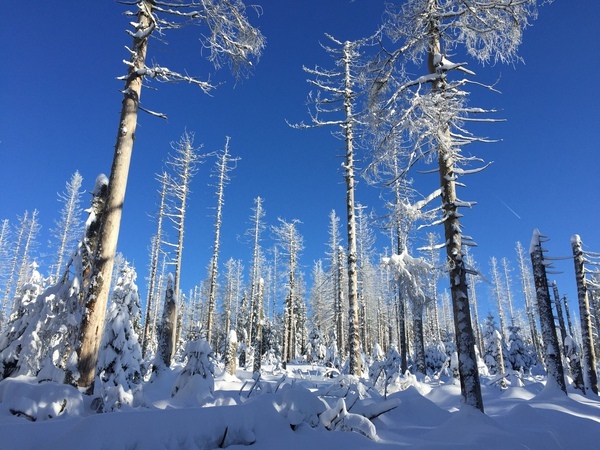 Later he wrote of his moment at the top: “So lonely, I say to myself, while looking down at this peak, will it feel to the person, who only wants to open his soul to the oldest, first, deepest feelings of truth.” His hikes in the Harz triggered his interest in science. Later, the Brocken featured in a famous scene in “Faust”, where the devil takes Faust up to the Brocken on Walpurgis night. The Brocken. “Tonight the mountain is mad with magic”, said Faust. 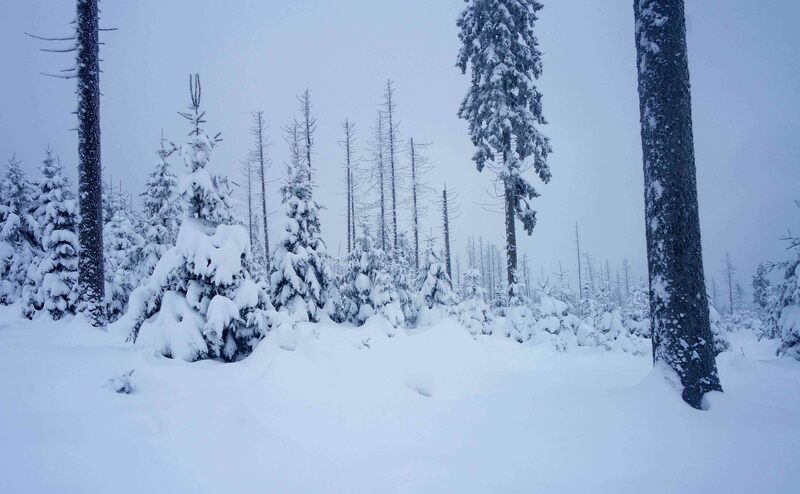 Fairytales and witches are also associated with the Harz. 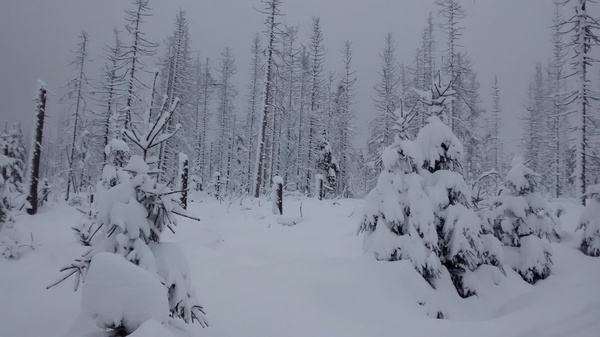 According to local legend, witches gather on the Brocken on the 30th April. When you’re in the Harz, you will often come across “Hexenbier” or other witchily named drinks. Somebody we travelled there with said he knew someone from Harz whose great-great-great grandmother had been burned as a witch. Just a legend? Well, the Harz is full of legends. 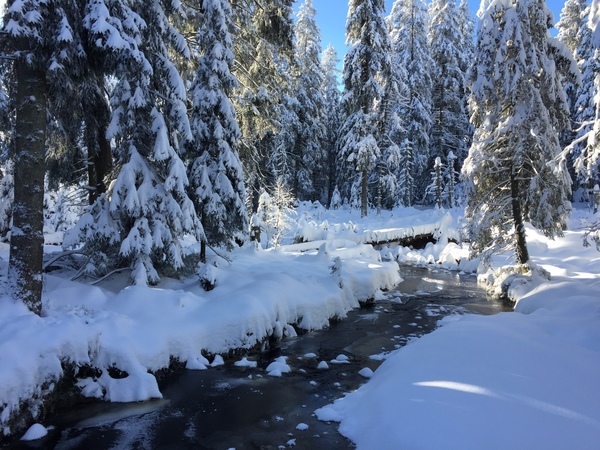 Many of the famous fairytales have their origins in this area (think Hansel and Gretel, Little Red Riding Hood, Snow White and the Seven Dwarves – forests and mines! ), and the charming high-roofed, wood timbered houses of towns like Goslar, Wernigerode, Bad Harzburg and Quedlinburg take you back in time. 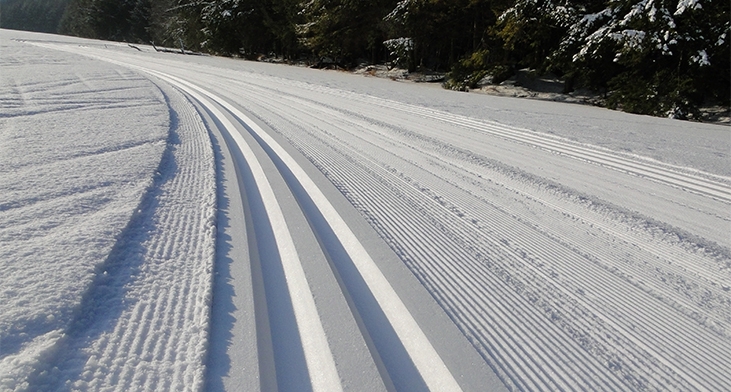 I’m ashamed to admit that when I first came across these tracks while walking in the mountains in Switzerland, I had no idea what they were for, and thought the two lines were nice ridges to put your feet in for walking more easily in the snow. When the machine came past I was happy he was making me nice new lines to walk in. I guess he was cursing me from inside that truck. 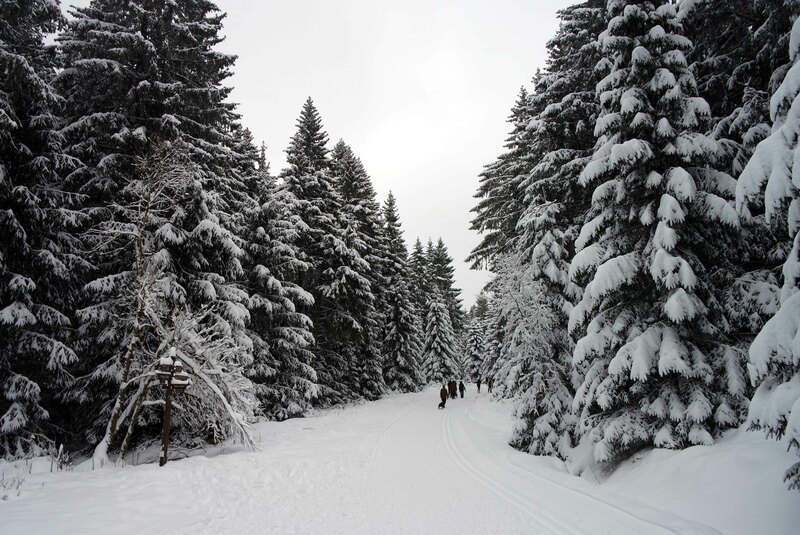 You find yourself in three situations in cross country skiing (or Langlaufen, as Germans call it). Going on a flat surface. Woohoo! This is probably the most fun, except for slight downhills (slight – not steep!). 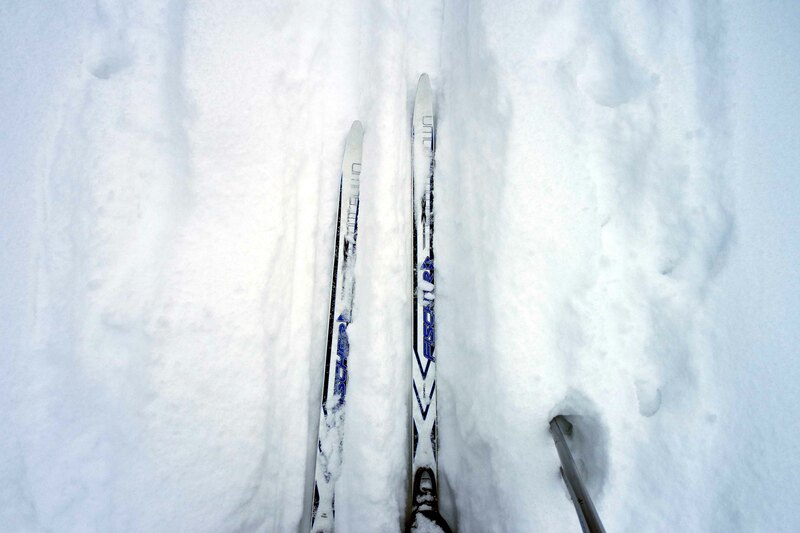 The skis have ridges undeneath that help them grip a bit to the snow, and are waxed so that they also slide smoothly. Your ski shoe (much less stiff than a downhill skiing boot) is bound to the ski only at the toes, so you can lift your heels and slide forwards in a movement almost like fast walking. Because you slide, you can go forwards faster than with walking. Going uphill. Hard work! The grip of the skis keeps you from sliding down, but you need to put some pressure on the front of the foot to get the best grip. Going downhill. Damn scary! Until you learn how to stop. 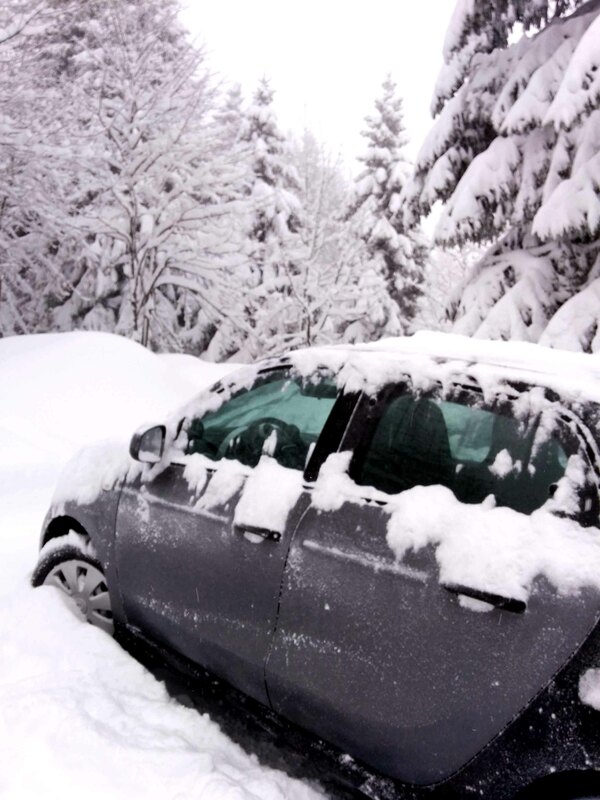 It’s easier to stop when you are not in the tracks and can do a snowplough. 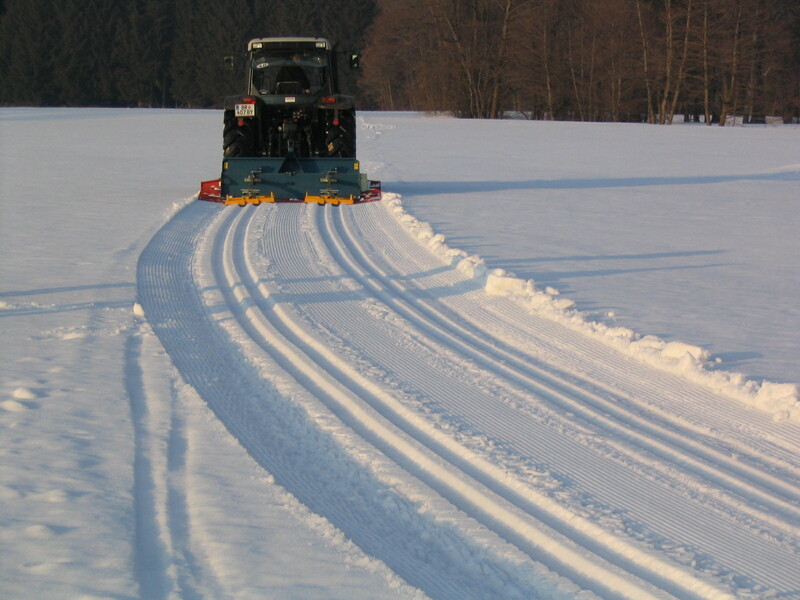 Snowplough is not so easy as it is on downhill skis, since they are so much longer and harder to control. If it’s not such a steep hill you can just enjoy sliding down on the tracks. Often there will be tracks leading up a hill and not down (if there is only a track on the right side, that’s for the people who would be travelling on the right in a right side driving country). On the first big hill we were going down, J told me I could just go down in the tracks (even though it was on the right side), since it looked like no one else was around. Of course, once I’d picked up a nice speed going downhill, what did I spot further in the distance but a family slowly skiing up. With no idea how to stop, I had to commit harikiri, throwing myself off the track. 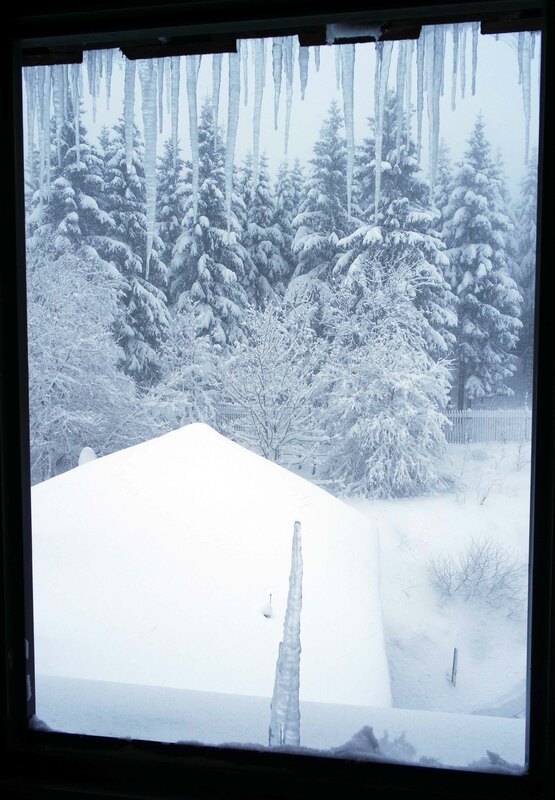 Luckily there was lots of snow. I crashed a lot the first day, mostly on the downhill sections, in many spectacular ways worthy of photographs (unfortunately no one ever catches those moments). 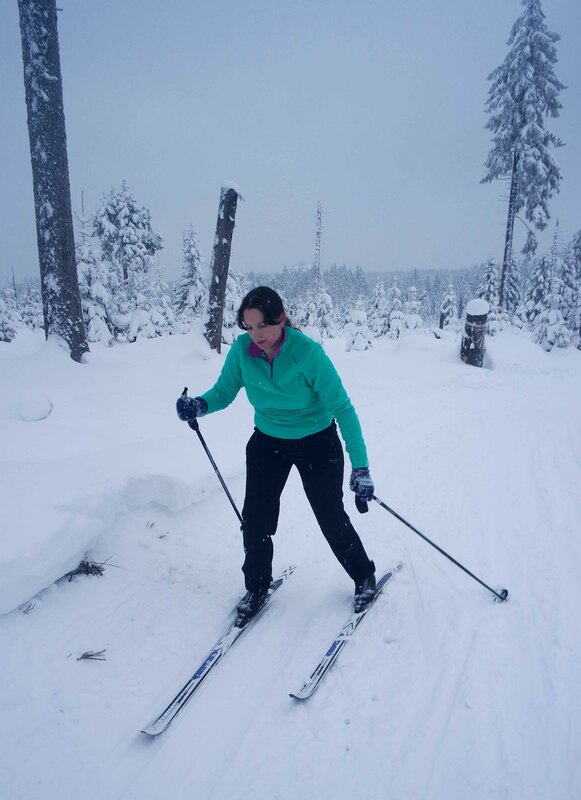 Luckily the locals in Harz are very friendly, and were offering all sorts of tips, and by the end of the way I finally learnt the most effective way to snowplough (Keep your knees together! Stay straight up! Put the poles in front of you!). One of the locals suggested that keeping one foot in the track and one out was a good way to go down slowly, but I never quite got that right, so snowplough was the way to go for me. 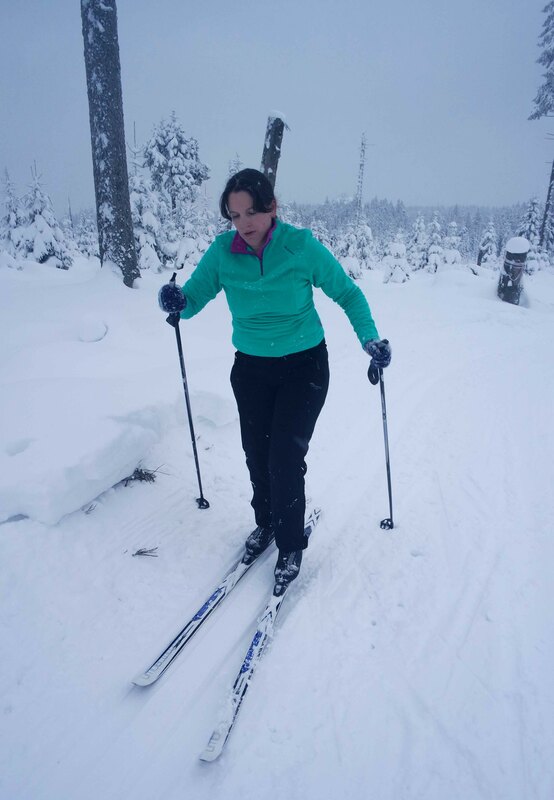 Here are some photos of my attempts to ski. We arrived on a Friday night. 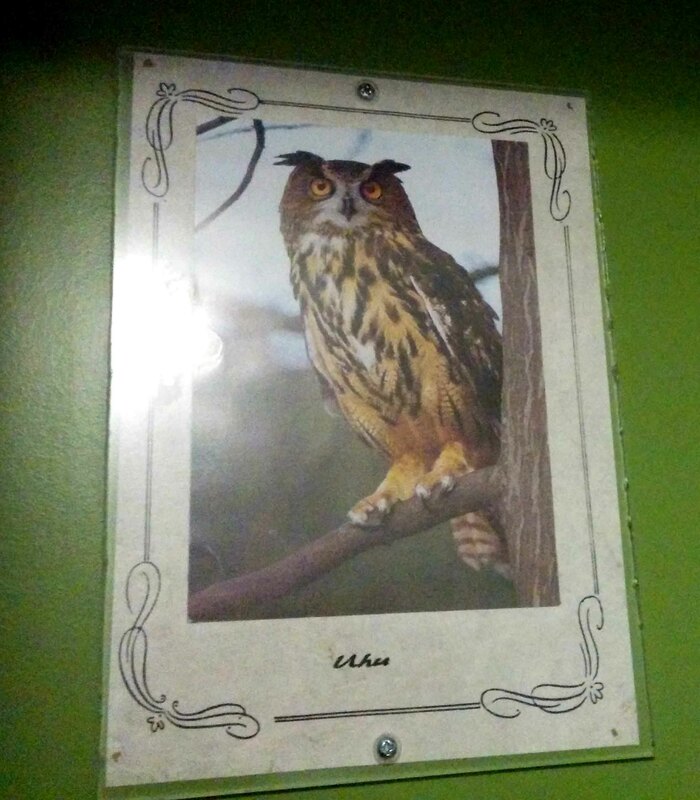 The hostel we stayed at at labelled its rooms with pictures of the different birds, by luck we were given the room with my favourite bird, the owl. Definitely a good sign! 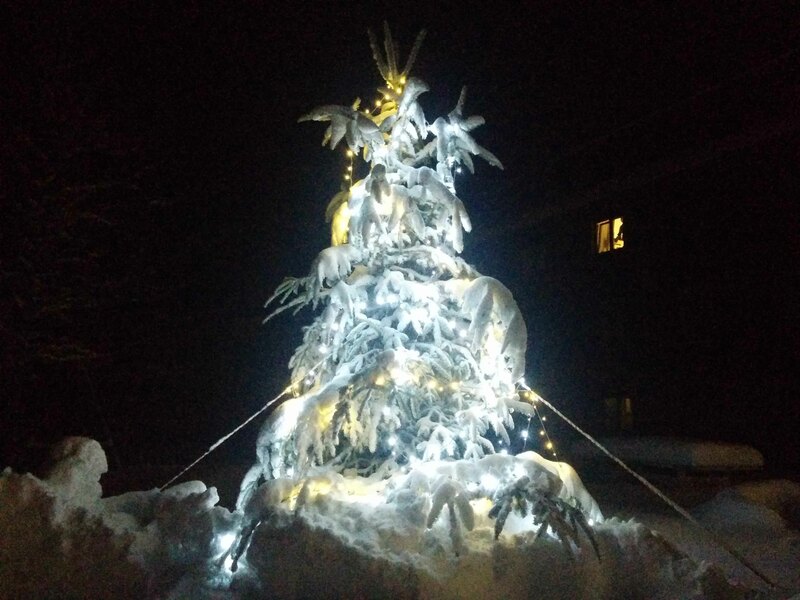 Although it was dark when we arrived, we could already see that there was heaps of snow, so it promised to be a great skiing weekend. What a lovely view to wake up to. On the first day, we started off straight, then downhill, cue lots of crashing (I fell over within the first five seconds, and that was on flat territory, so you can imagine the downhills). But it was beautiful. Although I was trying to keep up with the others, mostly tall men, I stopped every now and then just to wonder at the magical scenery. When I was a kid, The Lion, the Witch and the Wardrobe was one of my favourite stories. I just loved that scene where Lucy goes to hide in the wardrobe while playing hide and seek and walks through the back of the wardrobe into a snowy forest of firs in Narnia, where she meets a faun under a lamp post. 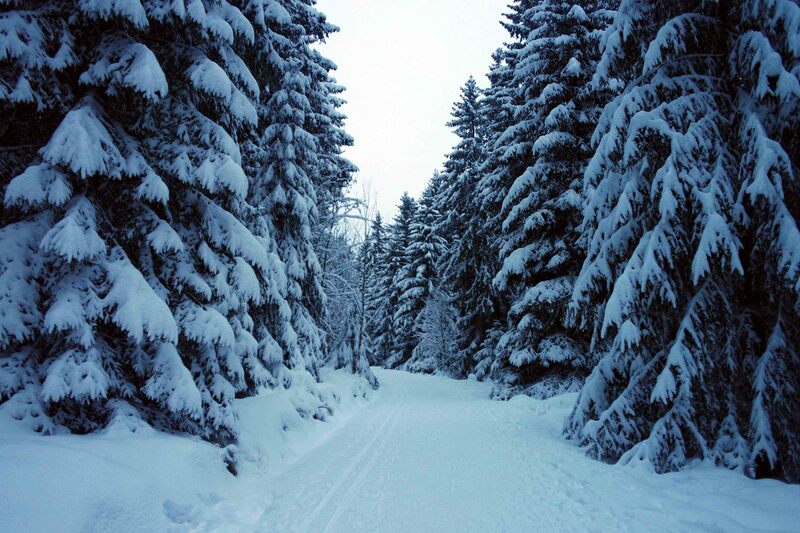 i used to go inside my cupboard sometimes, feel the back, and wish that one day it would open out into a snowy forest. 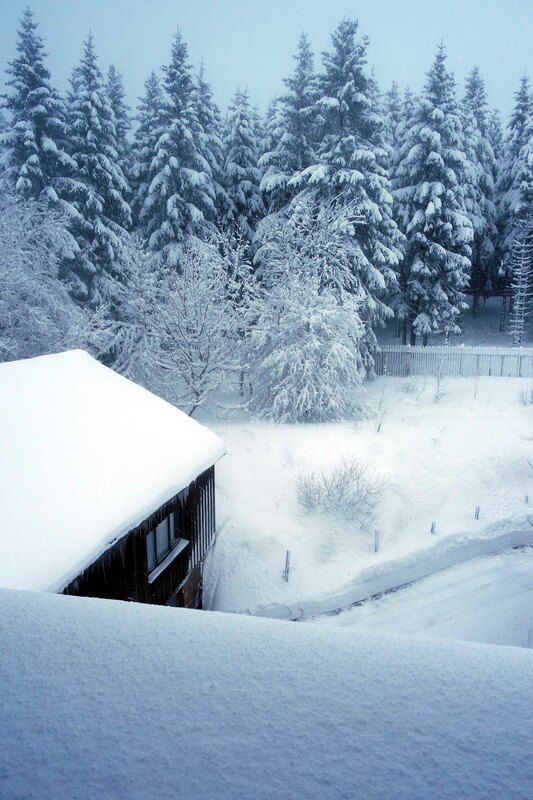 Well, finally in the Harz forest, I felt like I’d ended up in Narnia! 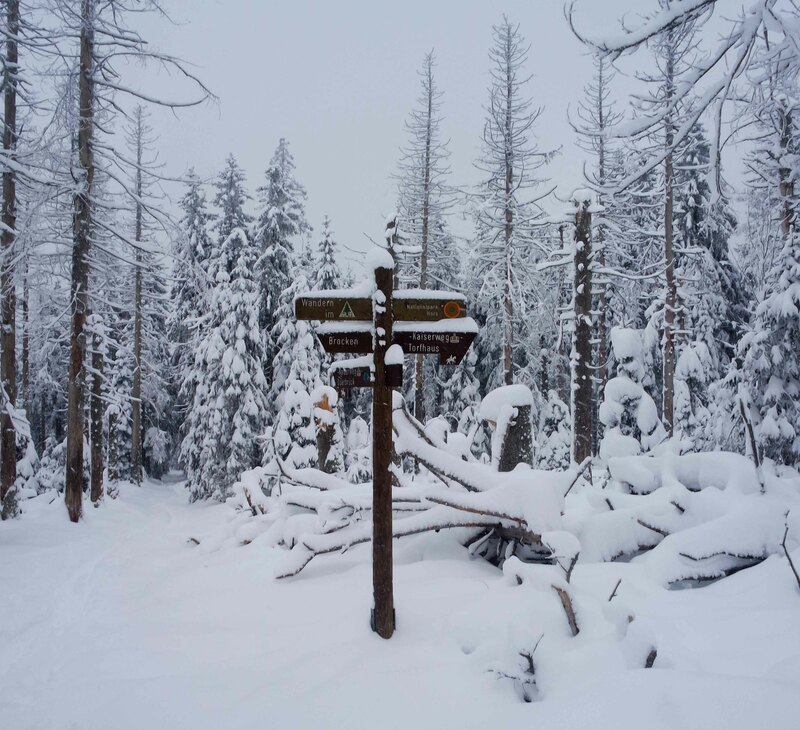 It was even snowing on much of the trail. After the initial downhill, we also did some flat parts and uphill. My favourite part was the slight downhill just before lunch, when it is not too steep and it ends on a flat part, you can just slide down effortlessly. We had lunch at a nice homey restaurant, pea soup with sausage. J tried the local version of Sauerbraten, which is some kind of “corned” meat. One of the popular meals in the area seems to be “Haxe”, pork knuckle roasted crispy. 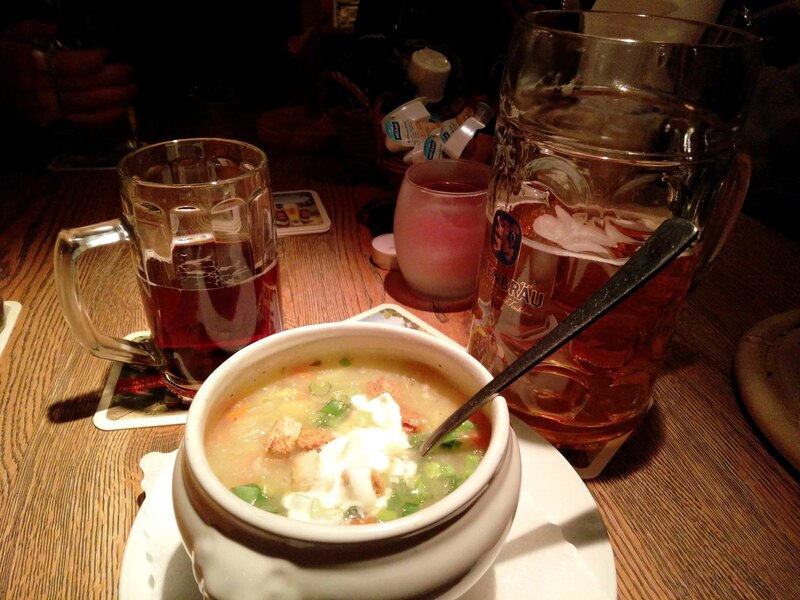 We ate a few times in a really nice restaurant in Torfhaus called “Bavaria Alm”, which had great potato soup and tasty local twists on hamburgers (served between local toasted rye bread), as well as good beer (J certainly enjoyed the Maas, the traditional 1L Bavarian beer). After lunch it was back up the hill. We arrived near the end of the trail with some time to spare, so did an extra loop, not realizing that it had quite a lot of downhill. 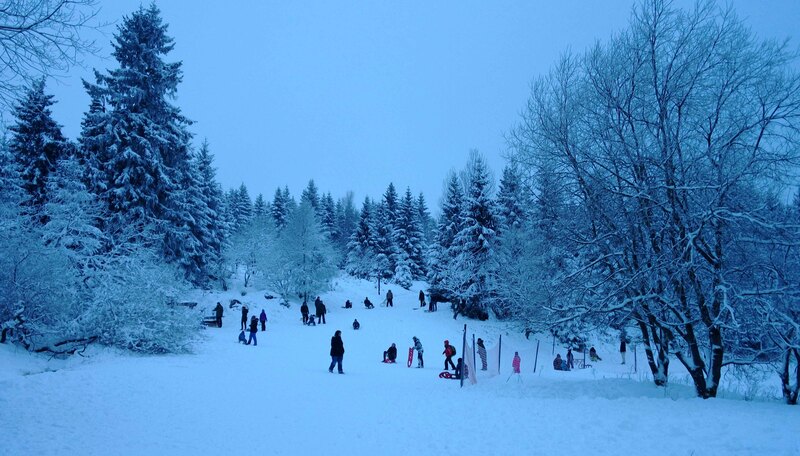 This was the stage where I learnt to snowplough with the helpful tips of people walking by, as there were lots of people out and about, going for walks or pulling sleds. 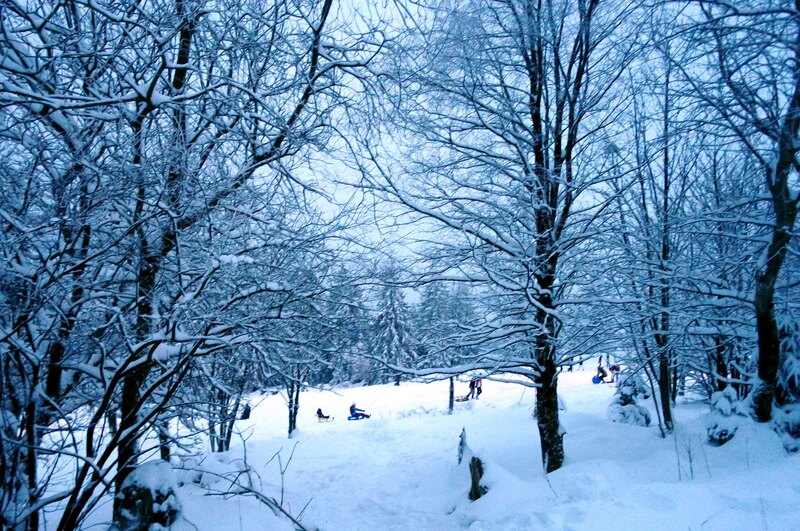 We ended up in a sledding area that reminded me of a Bruegel painting, with the people around, having fun in the snow. 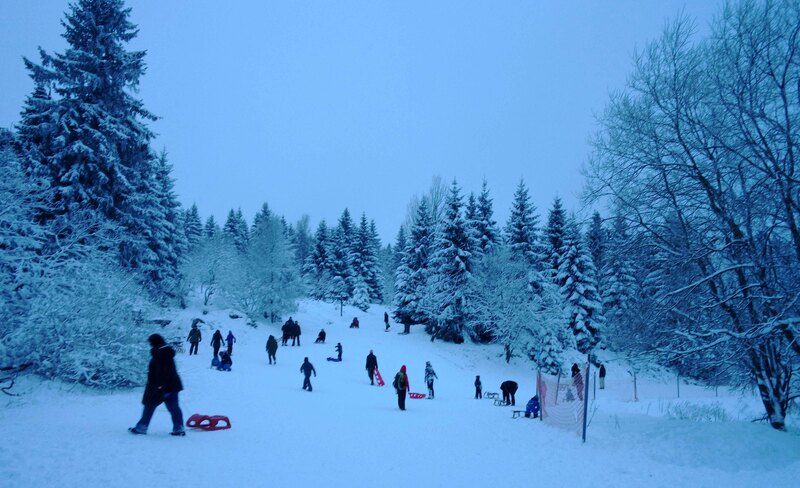 The last mission was to head up a steep hill back to our hostel (dodging some sledders racing down), where we joined the others for a beer and then dinner. 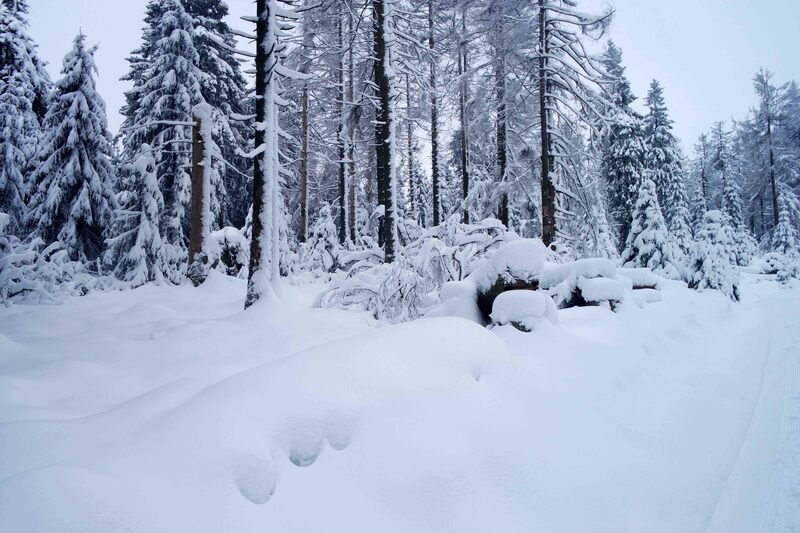 It had been snowing most of the day before and snowing all night, and we woke up in the morning to find about 30cm of fresh powder snow, bringing the snow around to something that looked around 80cm to a metre high! 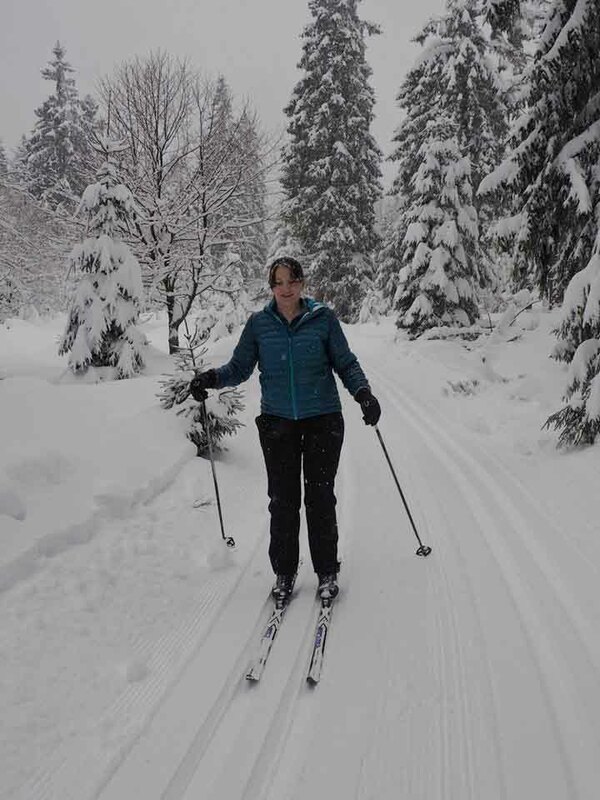 One of the advantages of fresh powder snow was that it was more sticky, so it was easier not to speed up too much (this is good only if you’re a beginner I guess – it did make skiing a lot more work). 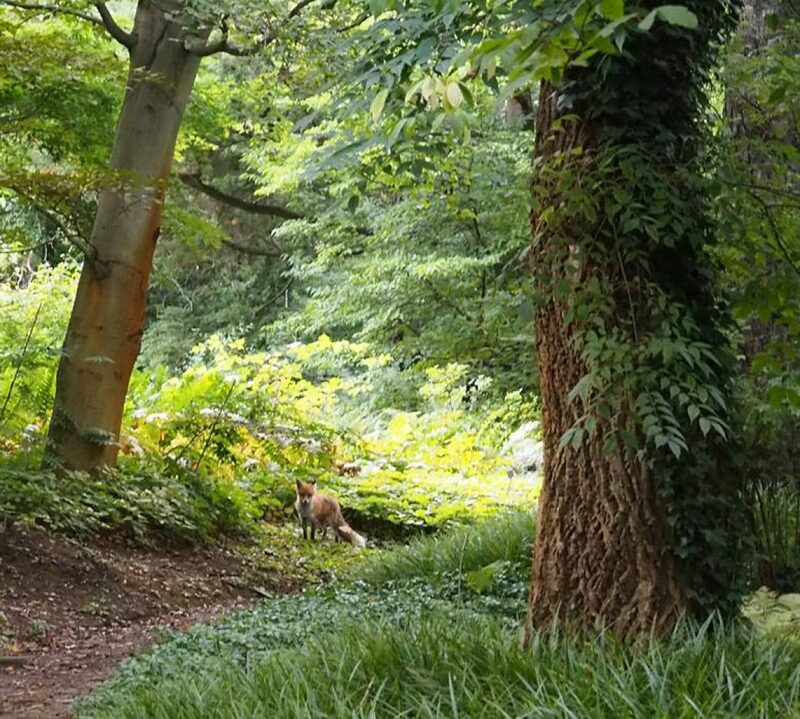 After following one of the routes around in the forest, we crossed a road and ended up on a trail less travelled. 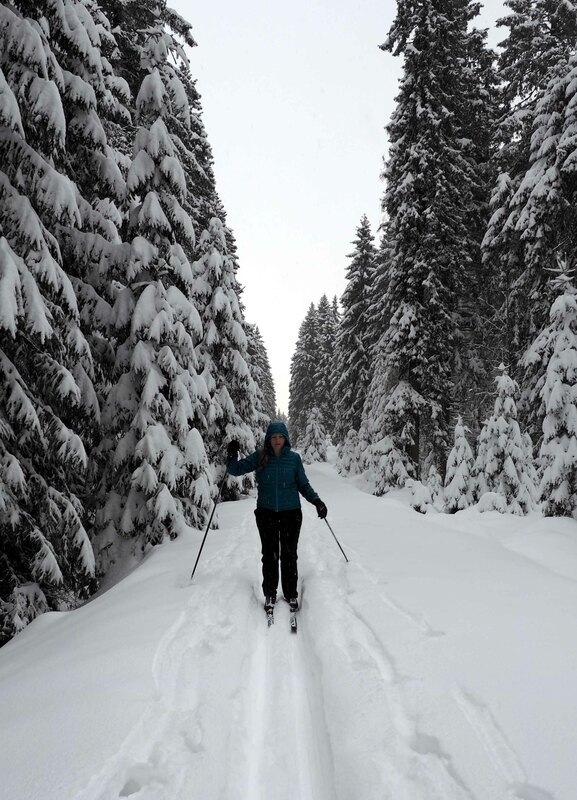 There were tracks but the snow around them was very deep, so it was quite an experience to be travelling through it. 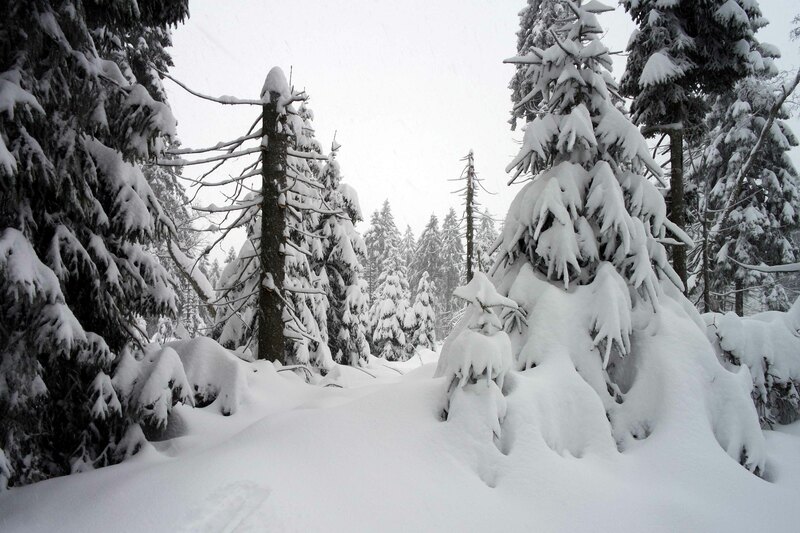 The great thing was we were almost alone on the trail, and being in the snowy forests on the mountainside was magical. Again our trail led conveniently to a lunch spot. 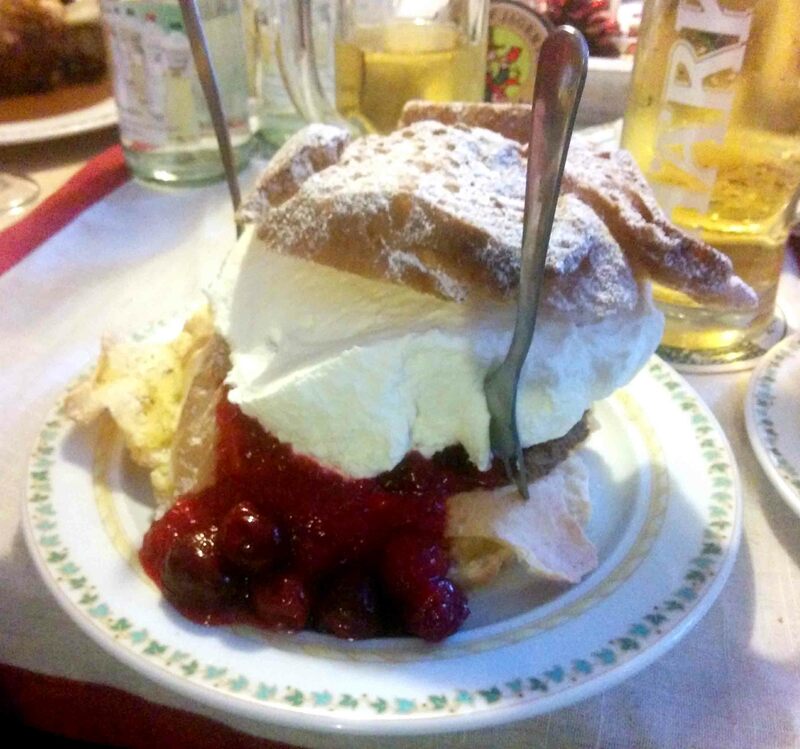 Here J and I shared an enormous “Windbeutel”, sort of like a giant German profiterole filled with cream and cherries (or other fruit). After lunch we were short of time to get back to Torfhaus before dark, so it was a non-stop marathon back up a long hill and then another hill. 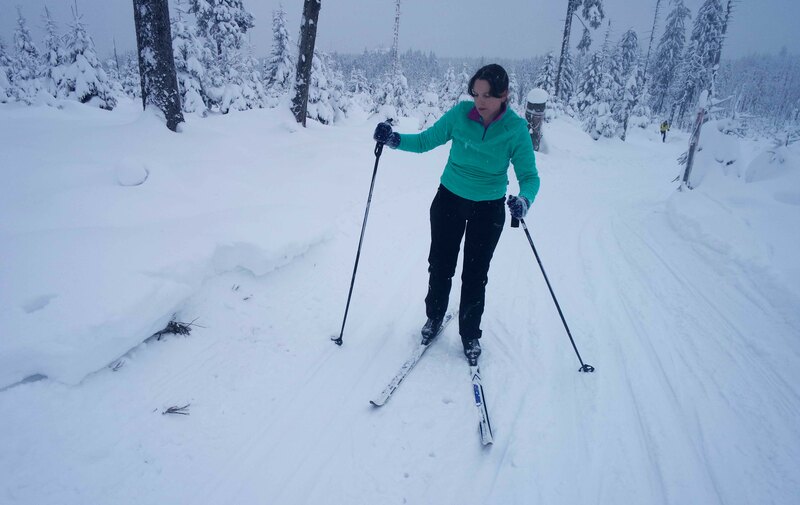 Cross country skiing is definitely good exercise. 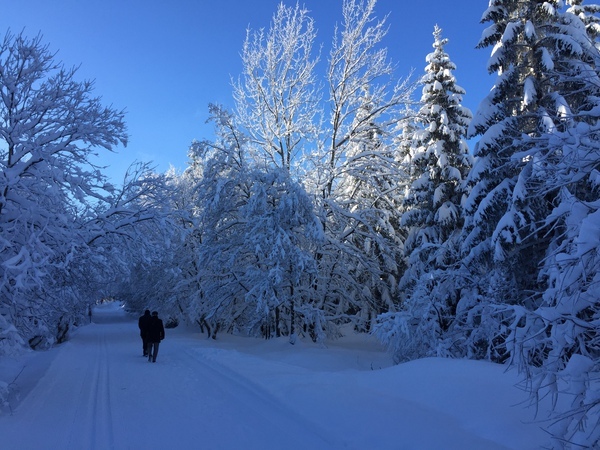 The forecast for the next day was sun and blue skies, and one member of our group who didn’t have to go to work the next day decided to spontaneously stay an extra day in the Harz. I would have loved to do that too, although practically it probably wouldn’t have worked since I had a big blister on one heel and bruised ribs from one of the falls. But he shared his photos with us, and the mountain looked just as amazing with blue skies, we will definitely have to go back! 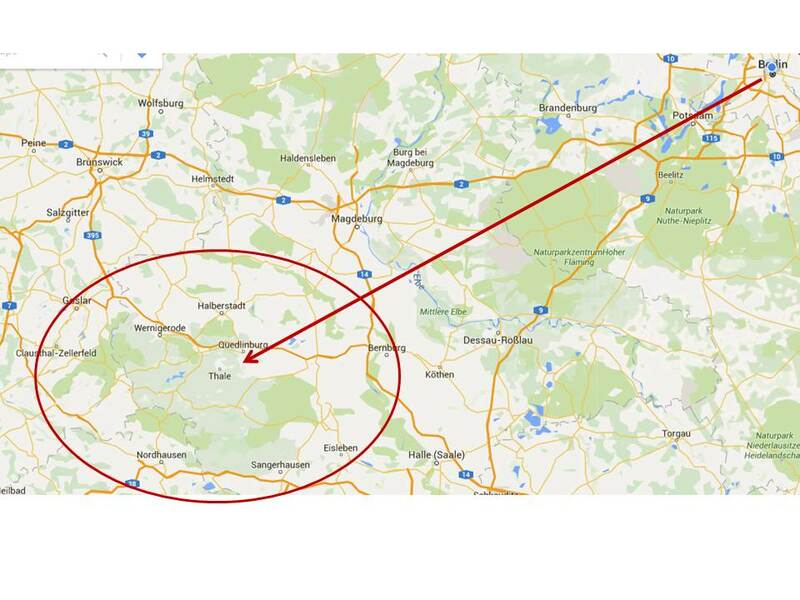 From Berlin you can drive there in approximately 3-4 hours, and there is also the Harz express train. Lovely Harz I am glad you have the opportunity to enjoy all these wonderful places. Thanks, yes I feel lucky to be able to see them!